In 2006, facing the prospect of a return to nineteenth century working conditions, the Victorian labour movement, with state government sponsorship, organised an impressive range of activities to commemorate and contemplate the significance of the 150th anniversary. The Melbourne Branch of the ASSLH was part of the planning process, with representatives on the co-ordinating committee. Beginning in March, a series of public events explored aspects of how working people in Victoria had campaigned to civilise the relationship between work and life. These events included Exhibitions and Performances as well as the organisation of two Conferences. In late June the Melbourne Branch of the ASSLH, in conjunction with the Australian Centre at the University of Melbourne organised a conference on ‘Working to Live: Histories of the Eight Hour Day and Working Life’. The keynote addresses and papers concentrated on the campaign for shorter hours, the complexities of agreeing on what constituted a fair and reasonable wage, how people managed their domestic and public working lives in specific communities and how justice for some workers has been long denied. There were also some international studies that provided an interesting comparative context to the Australian experience. At the end of that conference Belinda Probert delivered a robust plenary address entitled ‘Would you like choices with that?’: Women, work and family under Howard. Copies can be downloaded from the University of Melbourne website as a .pdf. This was immediately followed by a more contemporary conference, New Standards for New Times: The Eight Hour Day and Beyond, organised by a team from RMIT associated with the Labour and Industry journal. Participants at that conference addressed a range of issues associated with how Australia and other countries define and manage working-time problems that confront us all. This is an edited extract from Labour History, Melbourne Celebrates the 150th Anniversary of its Eight Hour Day, by Peter Love (President of the Melbourne Branch of the Australian Society for the Study of Labour History). (Source: Peter Love, ‘Report: Melbourne Celebrates the 150th Anniversary of its Eight Hour Day’, Labour History, November 2006). THE TIME OF THEIR LIVES: Under the general sponsorship of the 888 Organising Committee and with financial assistance from the Victorian Ministry for the Arts, the branch published a book of essays exploring the historical and contemporary significance of the Eight Hour Day and the working lives of ordinary people. Copies of the book were distributed to Labour History subscribers; however, a small number of additional hard copies can be purchased from ASSLH; a fixed eBook version is available via Amazon. Julie Kimber and Peter Love (eds), The Time of Their Lives: The Eight Hour Day and Working Life (Melbourne: Australian Society for the Study of Labour History, 2007). ISBN: 9780980388305 (pbk.). ISBN-13: 978-0-9803883-6-7 (eBook). Samuel Duncan Parnell is one of the most recognisable names in New Zealand labour history. Unlike the other contenders for the title he was not a Labour Prime Minister such as Michael Joseph Savage or Peter Fraser. Nor was he a trade union leader like Fintan Patrick Walsh, the Black Prince, or Jim Roberts, the uncrowned King of the New Zealand labour movement.2 Rather, Parnell’s name is inextricably linked to the eight hour day. His grave in Wellington’s Bolton Street Cemetery describes him as the ‘Father of the Eight Hour Day. Whose Direct Action in 1840 Pioneered the Establishment of the 8 Hours Day for All Workers.’ This chapter briefly recounts the Parnell story. It then discusses the subsequent transformation of Parnell into a labour legend, briefly notes the legislative entrenchment of the eight hour day in New Zealand and finally raises some issues which suggest that the legacy of Parnell is perhaps more complicated than conventional storytelling generally concedes. In this chapter I discuss the uses made by nineteenth century Victorian building unionists of the Eight Hour Day as a social symbol. Today, Melbourne has several monuments which remind citizens of the building workers’ association with the Eight Hour Day. A plaque at Melbourne University’s Law School commemorates the masons who began the campaign there in 1856. Outside the Trades Hall building a statue celebrates the three eights – eight hours each of rest, recreation and labour. In the Melbourne General Cemetery, a monument, originally erected in the 1870s, but refurbished in the last decade, honours James Galloway as a founder of the Eight Hour Day. Until 1952, the building workers’ achievement of the Eight Hour Day was the occasion of an anniversary march through Melbourne’s streets. Although today only the Labour day holiday reminds us of this celebration, when Brian Fitzpatrick wrote his Short history of the Australian labour movement, in which the sole discussion of the building industry is an account of the events of April 1856, the tradition of commemorating the eight hour victory on Melbourne’s streets still linked popular memory and popular history. Before 1914 and the development of the Anzac legend, the Eight Hour Day festival was one of Australia’s major annual celebrations. ‘Few working class festivals,’ Reeves and Stephen wrote, ‘have acquired the stature and popularity Australian Eight Hour Day celebrations achieved during the nineteenth century’. Through this celebration the Eight Hour Day acquired a cultural meaning much richer than any mere industrial condition. Thomas Charge, the painters’ unionist, described it as a ‘religious sentiment’. The sentiment, however, had political uses, both in assisting unions to make claims on society, and in the competition for power and status within Melbourne’s union movement. This chapter traces those webs of significance that the building unionists spun around their boon. Unionists in what was then Queensland’s second city, Rockhampton, first celebrated Eight hour day in 1909, with a permanent inter-union body organising an annual street parade, sports carnival and other activities for the next two decades. The event commemorated the 1856 attainment of the ‘Great Boon’ of the eight-hour working day by organised building trades employees in Melbourne and their campaign to extend the principle of eight hours toil, eight hours rest and eight hours recreation to all workers.1 As observed in other places, Eight hour day celebrations in Rockhampton, and those of its Labour Day successor from 1919, altered over that period. However, whereas planning and executing Eight hour day activities elsewhere were typically the province of trades and labour council sub-committees by the 1920s, the local body remained independent to its collapse in 1930. Drawing on evidence from the records of the inter-union organising committee and other union bodies, and from contemporary newspaper reports, this section of the book considers the dual character of Eight Hour Day in Rockhampton: the public face of demonstration and celebration and the rather shrouded world of behind the scenes inter-union organisation. 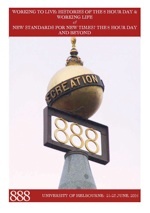 The chapter demonstrates and explains how the significance and changing nature of the day changed over two decades; examines the role of the Eight Hour/Labour Day Celebration Committee in the early Rockhampton union movement to illustrate the contribution such bodies made; explores the internal dynamics of the organisation which ultimately brought about its demise; and considers why the committee remained independent during its lifetime and why it did not give rise to a peak industrial body. In a recent article in Australian Historical Studies, Mark Hearn argued that Justice Higgins’ famous Harvester Judgement was ‘not bold in the rate it set for an unskilled labourer’ ; 42s was ‘only a few shillings a week more than the contemporaneous decisions in the Commonwealth or state jurisdictions’. The frugality of this determination was emphasized in the evidence on family budgets presented to the Arbitration Court. Frederick Kent, for example, earned 9s per day but he testified to the court that even on this wage there was no scope for ‘amusements, or liquors, or savings’ and he had to supplement his work as a blacksmith by working as a billiard marker. Hearn suggested that Kent’s wage of 54s per week was typical of those who gave evidence. ‘Considering every aspect’, Hearn argued, ‘Higgins could award no more than 7s, he was hemmed in by precedent – legal and cultural – and a reluctance to inhibit nation-building enterprise, reflected in his awe-struck appreciation of the Sunshine Harvester Works – “a marvel of enterprise, energy and pluck”’. McKay, Higgins wrote, ‘has invented successful machines and has produced them in great numbers in competition with the world’. Furthermore, Hearn argues, Higgins had no intention of challenging employer prerogative and his reluctance to interfere in management strategy facilitated McKay’s reorganisation and control of the labour process in his factory in the period 1907-1920. Mark Hearn is the latest in a long line of historians who have been fascinated by Justice Higgins and his Harvester Judgement and the subsequent part this decision played in the evolution of Australian industrial relations. Yet like most of the literature on the Harvester Judgement, Hearn’s work tells us little about the implement making industry, the men who were employed in this industry and the manufacturers who employed them. Hearn, for example, is drawn to the famous 42s for unskilled workers and argues that Higgins’ decision facilitated work place re-organisation. Yet the wage for the unskilled , however, was only part of the award. Higgins set wage rates – and generous wage rates – for skilled work. It was these wage rates that agricultural implement manufacturers – and particularly the major employer H.V. McKay – were most concerned about. For these wage rates had profound implications for McKay’s attempts to reorganize the work place and control the labour process. In 1920, the eight-hour working day and the 48-hour working week were legislated in Sweden. With the intention of proposing this legislation, the Swedish liberal socialist government appointed a Working Time Committee in 1918, composed of representatives of government, employees and employers. This tripartite system, rare at this time, would become synonymous with the Swedish ‘policy of compromise’ or ‘the Swedish model’. This chapter examines this Working Time Committee and the debates that engulfed it. This chapter is about time. It is about the struggle that persists for workers and their unions over hours worked. Drawing on the history of the Victorian Branch of the Federated Furnishing Trades Society, different aspects of the battle for shorter hours will be told. These stories include: in 1859 the Victorian Cabinetmakers took solidarity action in support of a strike by Coach makers over the eight hours system; in 1883 furnishing trades workers won the eight hour day; in 1920 women carpet sewers set a precedent when they won a forty-four hour week; and in 1998 workers at Pilkington Glass factory lost their prized thirty-five hour week. Arguably employers hate shorter hours more than they hate any other single condition fought for by workers. When there is no work taking place there is no profit made, it is not a question of relative profit, it is an absolute. For this reason the relentless fight for shorter hours in the history of the Federated Furnishing Trades Society shows the persistence with which employers try to impede workers from getting shorter hours. The following deals with four moments in the history of the furnishing trades in Victoria as examples of the difficulties and the breadth of activity that is taken by unions in the struggle for hours. Because they can be politically unexciting, leave few personal papers and diaries, and are located in the largely unrecorded private sphere, home-centred working class women are not well-represented in the Australian historiography. This chapter discusses one aspect of the lives of early twentieth century waterfront women in Sydney – their fertility – to attempt a more complex representation than convenient stereotype. If multiple sources are interrogated for inference rather than positivism, it’s possible to arrive at an understanding of what kinds of things mattered to working class women, beyond the stereotypes of heroic support for their husbands’ union battles, or ever-faithful tending of hearth and home. In the early to mid 1970s, a number of social welfare organisations published highly critical assessments of the status of migrant women workers, particularly in Melbourne’s textile and clothing industry. Trade unions were considered to have neglected these most vulnerable of workers due to ‘apathy’ and an inability to cope with linguistic diversity. Although Victoria’s textile and clothing unions had been providing some translated information and services already, this period of criticism marks the point at which unions began to markedly improve services to non-English speaking members, particularly women. This improvement is evident in the recollections of former textile and clothing workers, women who migrated to Australia from Italy, Greece, Cyprus and Estonia in the 1950s and early 1960s. Finding jobs at such companies as Sportscraft, Slade Knitwear and Holeproof, these women were an essential part of the industry’s self-proclaimed ‘golden times’. Their eventual retirement in the 1980s, forced or otherwise, marked the decline of a major Australian manufacturing industry. Their oral testimony shall be presented here as a means of examining how the relationship between migrant women and trade unions evolved during these decades. Feminists in Australia have repeatedly queried how the concept of the eight-hour working day could conceivably be aligned with the historical realities of working mothers’ experiences of waged work. Historically the domestic work of the house ensured that the housewife seldom enjoyed eight hours of play, or eight hours’ sleep for that matter. The life experience of mothers who engaged in both domestic and waged labour from the nineteenth century onwards – at first predominantly deserted wives and poor widows – has been portrayed as one of gross and often bleak overwork. Notable European socialists, writing from the perspective of countries where large numbers of women were becoming absorbed into large-scale industrial production, had confronted the concern about the excessive work hours of waged married women during the nineteenth-century debate on the ‘woman question’. They regarded the factory as a site of exploitation but also as a place where social improvement and the eventual emancipation of women could be won by collective action. They therefore asserted that the full entry of married women to waged work was central to women’s liberation. No woman could be free, they said, if throughout her adult life she were dependent for a livelihood on another person, her husband. But access to a direct wage, or economic independence, was merely the first step to women’s liberation. They did not doubt that women’s current domestic work in child care, house cleaning, meal preparation, the care of clothing and innumerable other tasks was real work and it would not simply disappear with modernity. If women were not to be grievously overburdened, their entry to remunerative employment would necessarily need to be accompanied by community solutions to the significant tasks of the home. But such provisions, requiring the deployment of community resources, and the humanisation of working conditions, they deemed impossible under a capitalist economy. Women’s full liberation would be possible only with the advent of socialism. The Government Railway Workshops at Midland closed in 1994, after a 90-year history as Western Australia’s largest industrial factory. Long before the closure, however, the Workshops had ceased to be a place of permanent, lifetime employment for many of the apprentices who trained there. Over a decade after the Workshops’ closure, Western Australia (like the rest of the nation) was suffering an acute shortage of skilled labour, requiring such government strategies as programs to attract skilled immigrants (reminiscent of the 1950s), and developing a ‘Fast Track’ Apprentice training program as well as ‘short training courses’ to alleviate the problem. This chapter, firstly, analyses the changing perceptions of a skilled trade in the second half of the twentieth century, in the context of the Midland Government Railway Workshops. Then, it examines the climate of change that contributed to the Workshops’ closure in 1994, and discusses some of its impacts. The chapter concludes by examining the human cost of the closure, and attempting to assess some of the longer-term impacts, particularly with regard to providing training for trades apprentices and maintaining a skilled workforce in the State of Western Australia. Drawing on a shop steward’s notes and relevant secondary sources, this chapter gives a view from the grass roots of trade union responses to major technological change in the newspaper industry around 1980. The chapter sketches the changing role of the reading room in the newspaper production process and outlines some actions of a group of proof readers at the Age. The chapter concludes with reflections on the continuing relevance of the issues at stake. In 1890 over one million acres in New South Wales, and more than one and a half million acres in Victoria, existed as officially designated common land. In New South Wales the commons were mainly located in country areas, spread around 296 localities; this meant that virtually every country town had its common, ranging somewhere in size between Brushgrove’s eighteen and Cobar’s 67,550 acres, with many commons being 500-5,000 acres. Common land in New South Wales and Victoria was only one instance of the widespread colonial practice of reserving specific pieces of land from private alienation. Thus in ninetheenth century New South Wales the commons – denominated as either Temporary or Permanent – were augmented by a variety of reserves, the most important of which were set aside for travelling stock, pasturage, timber, water, indigenous communities, camping, recreation, ‘public purposes’ (schools, churches, cemeteries), village, town and suburban expansion. While the combined acreage of these non-commodified spaces is extremely difficult to calculate, their number and sometimes vast extent meant that the landscape of colonial south-eastern Australia was a patchwork of commodified private property and non-commodified space. I want to emphasise at the outset the existence of commodified and noncommodified land in colonial Australia, not simply because the existence of the latter is usually under-recognised in the literature, but more importantly because the argument presented below hinges around the tensions between these two conditions in which land existed. Socially and politically, as I hope to illustrate, these tensions were expressed in conflict and antagonism. Thus, my argument is also pitched against historians such as Powell, who argued in The Public Lands of Australia Felix (1970) that the commons were a ‘safety valve’ – a resource base that eased the class antagonism between small farmer and large pastoralist in nineteenth century Victoria. I argue that far from being a ‘safety valve’ the commons – in New South Wales at least – were the interface between commodified and non-commodified forms of both landed property and labour, and as such were sites of antagonism and conflict. Comparisons of wages or employment conditions can be dangerous things. Governments and politicians can get quite nervous about them. Bosses often don’t like them at all. Unless, of course, the comparison turns out to be favourable. For example, the current minimum wage in the USA is $5.15 per hour or about AUD$6.80 on current exchange rates.2 In Britain it is £5.05 per hour or about AUD$12.60.3 In Australia, of course, it is AUD$12.75 under our late lamented Award system.4 But economists would argue that an accurate comparison should take into account not just the wage levels but also what that money will actually buy in any given economy. They call this concept Purchasing Power Parity and usually come up with a basket of common staple consumer products like bread, and milk, and fresh fruit and vegetables or even Big Macs to compare with average earnings. Unfortunately this has its problems too. The relative tax rates may distort the picture. As may subsidies for certain products. Even natural disasters can get in the way, witness, for example, the effects of the 2006 cyclone in Queensland, where the hourly rate of pay for an unskilled adult worker in Australia equalled about four bananas. There is, however, another approach to the problem of comparing working conditions – across workplaces, and between countries and even between workers in different historical periods – an approach which relies on the only truly common element in all of the above comparisons – Time. This chapter examines time in relation to labour: how employers have appropriated time from their employees, and the phenomenon of workers resisting this through forms of time ‘banditry’. With Australians already working some of the longest hours in the western world, the potential consequences of the new industrial relations legislation – which emphasises individual contracts and performance – are considered.